I have no idea how things work in a Re:start server. Assuming that they do work the same as any other server, everything should go smooth (changing priorities in the data.ini, files can be merged in the data.grf etc). Unless they've done something to the client that sets the server grf as the hard priority, then you'll be limited to map and mob changes (lua files won't work). Again, I have no idea on restart servers, nor do I take interest on playing in one. There are some servers I played that have no data.ini or forces clients to read a default grf but they can be bypassed by hexing and other methods. The bottom highlighted one looks like the one from your tutorial, so i edited it accordingly, put the sprites i wanted to use in(just larger versions of originals that i magnified the act file on) put it back in the grf and saved it. Nothing changes. I even tried basic stuff like turning a poring into other things and nothing worked. 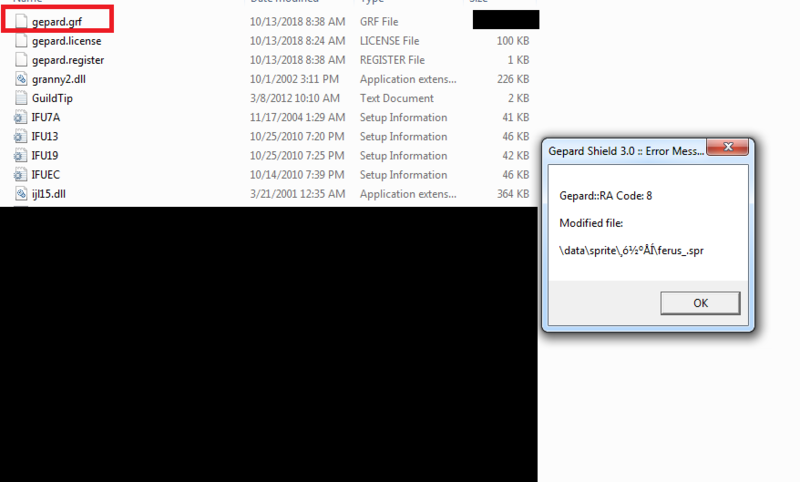 The other files all come up as gibberish in notepad and can't really be edited. Usually, the jobname file that's being used by a server is in the servername.grf (Example: YrvineRO.grf) not in the data.grf. If it is different, and by that I mean not the usual thing in pre-re where the data.grf and server.grf are visible in the RO folder, then you have to see things on your own. I skimmed through some Revo Classic threads in rAthena and I think they might have something to help you with. Knowing that you see "gibberish" means the files are encrypted. You can't really edit lua files when they're like that. You need to decrypt them. On another note, if there is only the data.grf... Try merging desu.grf in to the data.grf and see the results in game (You're gonna encounter errors for sure but hey, that's a good thing) Don't forget to back the data.grf file. Hi! i can't seem to download the grf. is the site broken? thanks in advance! Unless mediafire is down.... But as of this post, it's up. is the bio3 sprite edit works on official servers such as iRO? Someone PM'd me about it. He got the grf worked in an official server. Though you'd have to do other stuff to get it to work. Just to be clear, I don't play in official servers nowadays. So I don't really have much grounds on how the grf is gonna play out in an official server. This is really good. Can I use this in LimitRO? There is no Data.ini in the client though. I tried merging the grf with data.grf but still no effect. This is to prevent grf modifications. I saw this a while back in a WoE server. It's to prevent enlargement of essential characters like Clowns and Snipers etc. (titan.grf) for easy target. Though recently, mobs, lua file and etc. have been included. Your server admin probably payed for a package that disables mob modifications. Although there are still modifications that will still work i.e the aesthetics (effects and custom bars). You can see that there are still some mobs that are not listed/modified (Skeggies/Devilling/Angeling etc). It's because they're still not included in the gepard.grf yet... They will be added soon I guess. Nothing we can do about it, for now. What you can do is ask Lai to enable grf mods.